“Does your dog do anything?” growled the conductor of the Waterloo Central Railway when he punched my ticket. 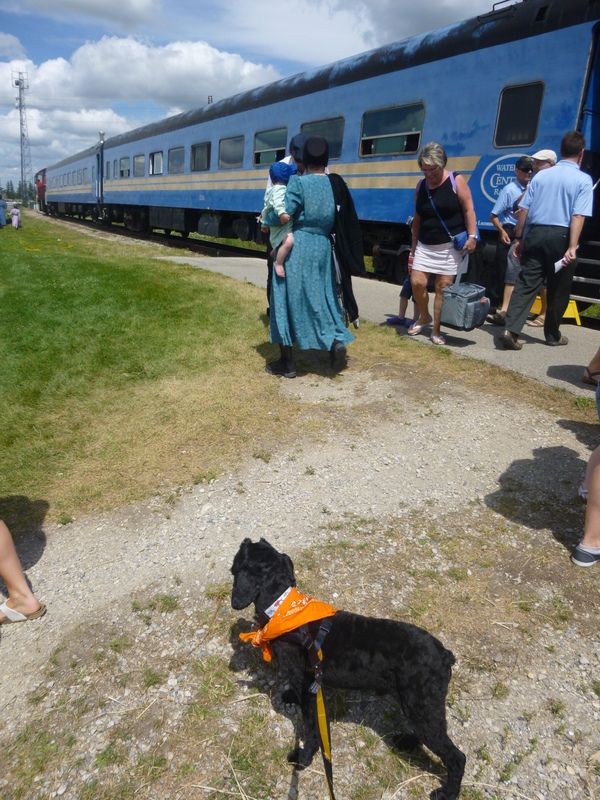 Me and my schnoodle Victor are at the St. Jacobs, Ontario station ready to board a tourist-focused heritage train that takes people 45-minutes away, then back again. According to the website, well-behaved pets are welcome on the ride from the St. Jacobs Farmer’s Market to Elmira, Ontario, Canada. “You mean like tricks?” I ask knowing full well what he meant. 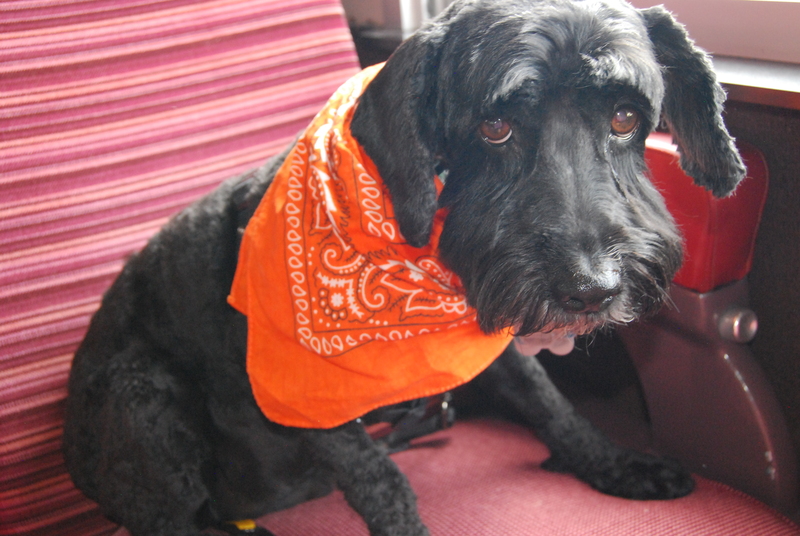 “If he barks or causes any problems, we stop the train no matter where we are and you have to get off,” he warns me. So much for welcome. Today, Victor and I are riding the rails. Only he’s got his orange bandana tired around his neck – not on the end of the stick. He has no idea why he’s here, but loves the energy of this crowded market as we head to where the train pulls in. “Hey, that dog’s a cowboy!” one kid yells pointing. Perfect. Just the reaction I was going for. 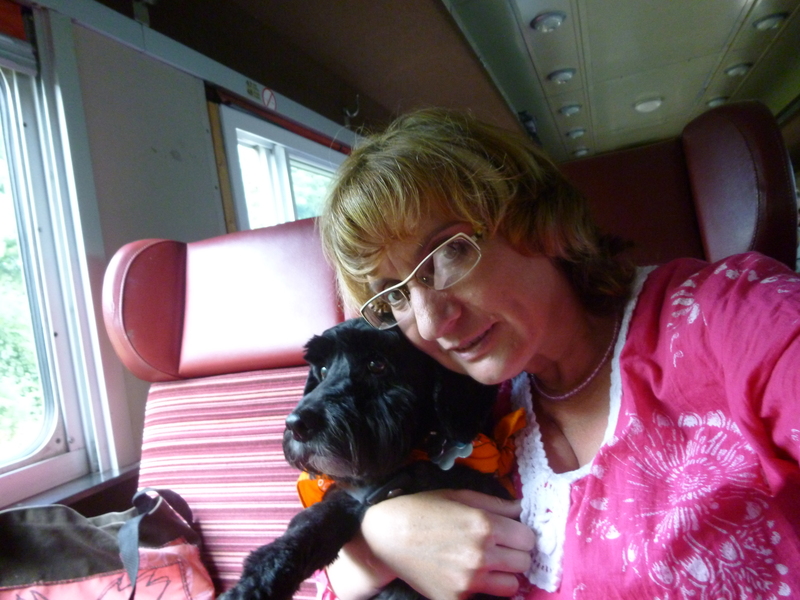 I carry Victor on the train car – we prefer the more comfortable upholstered seating of the 1950’s restored car to the vinyl seats of the 1920’s car. He curls up in the seat next to me, looks out the window occasionally, but otherwise shows no interest in this one-and-half hour adventure I decided to try for two reasons: One, a group of train enthusiasts have promoted this opportunity for years and I’ve been meaning to try it. Two, you can bring your dog. Well, I thought you could. ‘Pet-friendly’ means different things to different attractions. This train restoration and living history project is the passion of mostly volunteers who’ve fixed up this diesel train (and another steam engine they run about twice a year) so participants can experience the romantic train travel of days gone by. 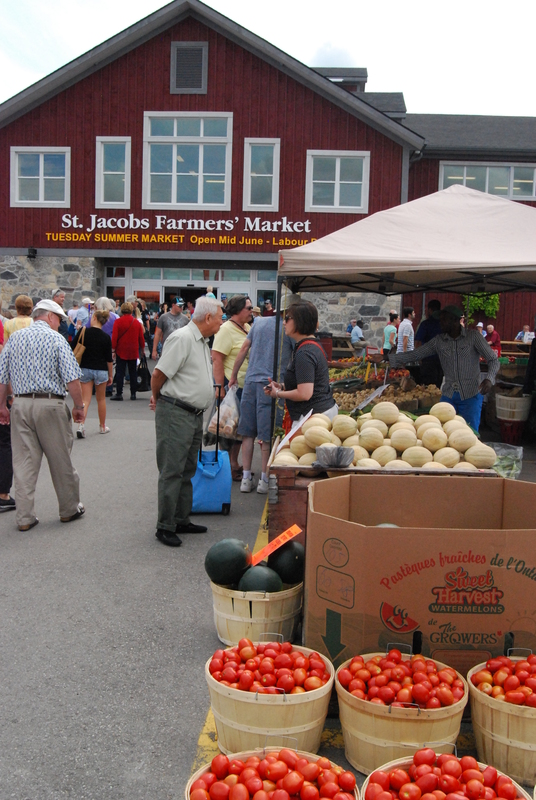 Tuesday, Thursday and Saturday in the summer you can board three times a day at the St. Jacobs Farmer’s Market (which is extremely busy and parking packed) then travel to a downtown St. Jacobs stop and get off then jump back on two hours later. Or, stay on and ride to the now end point: Elmira where I thought you could disembark, walk the trails with the dog and rejoin the next train. Not today. The Elmira stop isn’t finished yet. Recently, the Waterloo Central Railway had to reroute the excursion from a Waterloo park to a dusty parking lot in Elmira, about one mile from the Elmira town centre thanks to a new evolution in transportation technology: the building of a high-speed rail system. High-speed trains will bullet their way across southern Ontario – eventually – and through what was once the Waterloo park. In the meantime, this line intended for the experience only takes passengers slowly past the Conestoga River; the Home Hardware (a major Canadian hardware store) headquarters; the group’s train restoration garage; and the corn fields of the Brubacher’s Farm, a 6th generation mixed Old Order Mennonite property. 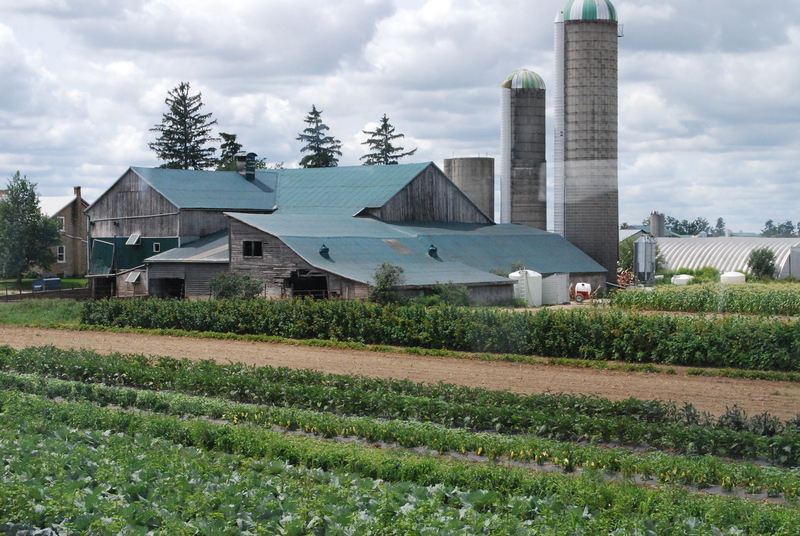 This is Mennonite country, hence the popularity of the market. The route is a bit scenic and the old-fashion whistle blows through every traffic crossing. Victor did nothing but lie down beside me, quieter than most kids on the train, many of whom got bored quickly while their parents and grandparents feed them candy and tried to relax. We chug to Elmira and back. After the ride (we didn’t get kicked off), Victor and I stroll around the market buying fresh veggies and staying out of the buildings that are unfortunately pet-free zones. We are noticeable, but he’s not the only canine on the block. Then a guy I recognize from the train crosses the walkway. Clearly, everyone loved my little cowboy on a train. Or at least, that’s how I’m telling it. Travel Guide: There are two dog friendly places in St. Jacobs to check out. One is in the market: Discount Pet House offers discounted pet supplies, accessories and great value on dog chews. The second is downtown St. Jacobs called Spoil the Dog Bakery specializing in wheat free treats. (More about that store here). A ninety-minute drive from Toronto, St. Jacobs has been a favourite get-out-of-town retreat since the mid-1980’s when the village capitalized on its rural culture and Mennonite history to consciously become a tourist destination. The small rural town has changed a little since it invested in the restoration of the Old Mill (one of the first sources of hydro-electrical power in Ontario). The St. Jacobs Farmer’s Market, three kilometres from downtown, is huge. Across the street are an antiques mall and a retail factory outlet. In keeping with the rail theme, St. Jacobs is also proudly home to the newly opened St. Jacobs and Aberfoyle Model Railway Museum downtown. Love this? Check out other quirky dog adventures such as The Port Burwell Conservation Area.